For nearly two decades the answer has been found in the bestselling The Millionaire Next Door: The Surprising Secrets of America's Wealthy, reissued with a new foreword for the twenty-first century by Dr. Thomas J. Stanley. According to the authors, most people have it all wrong about how you become wealthy in America. Wealth in America is more often the result of hard work, diligent savings, and living below your means than it is about inheritance, advance degrees, and even intelligence. The Millionaire Next Door identifies seven common traits that show up again and again among those who have accumulated wealth. You will learn, for example, that millionaires bargain shop for used cars, pay a tiny fraction of their wealth in income tax, raise children who are often unaware of their family's wealth until they are adults, and, above all, reject the big-spending lifestyles most of us associate with rich people. In fact, you will learn that the flashy millionaires glamorized in the media represent only a tiny minority of America's rich. Most of the truly wealthy in this country don't live in Beverly Hills or on Park Avenue-they live next door. Essentially: the super super wealthy are less than 1% of the population. Meanwhile much of the actual top 10-1% tend to be in jobs that go along with conspicuous consumption. Think lawyer, banker, accountant, doctor. They tend to feel that they have to maintain a certain type of lifestyle to be “respectable” in their profession. Buffet owns and manages businesses, not just investing in stocks. You become a business owner by either buying or starting your own business - think about that. You will gain experience if you work in a large company, but for that you need qualifications. Maybe a business degree, accounting qualifications, MBA, or similar. Try reading "The Millionaire Next Door ". You can learn how to become a millionaire but becoming a billionaire is another proposition. The internet can not tell you what to do. You need to make your own decisions. You're making claims and then confidently stating the burden of proof to prove otherwise is on people who disagree. Feels like the wealth and riches are more a product of what makes a person productive and happy, but the wealth itself doesn't necessarily create more happiness when only inherited. The bit your missing is those on the FIRE path generally come in one of two version: the first group approach FIRE by driving down their living expenses extremely low. Examples approaches are living off-the-grid tiny houses and eating rice and beans. Another low-cost tactic is living in low cost of living places (COLA) and in the extreme means moving to poorer countries ("retirement hacking"), e.g. Mexico with it's good weather and your USD goes further. MMM (build all my own stuff) and Market Timer (living in a cheap country) are two examples. I have a feeling this group is actually the minority of the two, but I don't have any surveys. I've only met two this type IRL (well, living this way by choice). The other type are high income earners who save a high percentages of their income. Bogleheads's survery and the little bit of self-reported data in the BH survey), this appears to be the more common path to FI. It certainly is easier to save lots when you earn a lot rather than try to squeeze every expense out of your life day in and day out for decades. That might be "the #1 predictor," but out of how many predictors? What "percentage" is it, if that term is even meaningful here? How do we decide what counts as "wealthy?" Is it income or assets? If income, what happens to people making $300,000 a year but spending it all (I have met these people). 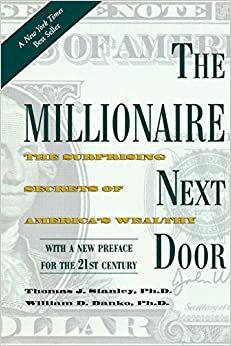 What happens to the Millionaires Next Door (http://www.amazon.com/The-Millionaire-Next-Door-Surprising/d... ; it has done more to shape my thinking about wealth than any other book. One surprising fact: most millionaires don't have extraordinary incomes but do consistently live below their means and save their extra money)? If having "wealthy" parents is the #1 predictor and accounts for, say, 20% of the likelihood of the next generation's wealth, and, say, education accounts for another 10%, what happens if 40% is noise / randomness? Then noise accounts for twice as much as wealth! Most of the actual peer-reviewed studies I've read about this topic come to the conclusions they do through some dubious data decisions. I'm not trying to pick a pointless, semantic fight here, but I see a lot of statements that try to compress a complex set of issues and questions into a single metric. As usually happens with this sort of thing, there's also an element of anecdote here: I have seen kids from wealthy families piss it all away and kids from poor families do the opposite. My own grandparents had virtually nothing and didn't speak English. Criminals and marketers already know how rich you are based on where you live. The fact is that most rich people live without showing off. They enjoy having the freedom to do in their lives what they want but they do not want other people kidnapping their children or blackmailing them. Or just people behaving different with them because of the money. You know Bill Gates used to park his car like everybody else in MS, until it became impossible for him to park without having 1 or 2 people ask him for money(on the tens of thousand of dollars each time). Or ask me. I am not Bill Gates, but for people in my environment I have "made it". Just putting my name in my HN account will significantly change how people react to my comments. You may like reading The Millionaire Next Door. It explains that the majority of millionaires in the US are like those you describe, and not like the flashy movie ones we see in the media.